Kenneth James Monty, age 85, died unexpectedly of natural causes on May 23, 2016. He was born on September 11, 1930, in Sanford, Maine. Ken was a loving and singularly empathetic father, teacher, mentor, administrator, gentleman, colleague and collaborator, as well as an avid musician and naturalist. Ken Monty dearly missed his departed wife of 61 years, Barbara H. Monty, former Director of the Office on Aging for Knoxville/Knox County, who passed away in May, 2013. He was preceded in death by his parents Leo J. and Evelyn Monty, of Reading, MA, and brother, Richard A. Monty, Ph.D., of Aberdeen, MD. He is survived by daughter Melissa L. Monty (husband Richard D. Johnson) of Elk, CA; son Stuart J. Monty (wife Lee Ann Hall Monty) of Orlando, FL; granddaughters Lisa Adams of New Hope, PA, and Kristina Caldwell and her three children, Anthony, Ray, and Leah, of Orlando, FL; sister-in-law Margaret Monty of Urbana, IL; brother-in-law Frederick Vesely, Sr., of Hartwick, NY; nephews Frederick Vesely, Jr., and Michael Vesely, plus extended family residing in northeastern states. Dr. Ken Monty graduated from Reading Memorial H.S. in Massachusetts in 1947, Bowdoin College in 1951, and the University of Rochester with his Ph.D. in 1956. He was a post-doctoral researcher at Johns Hopkins University from 1956 to 1962. In 1963, Dr. Monty and his family moved to Knoxville, Tennessee, where he became the Founding Head and professor of the Department of Biochemistry at the University of Tennessee. 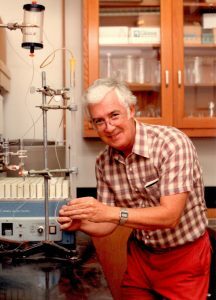 Dr. Monty brought a unique focus on research and teaching to the newly created department. From a modest start of five faculty members focused on graduate education, his early guidance and vision helped the department evolve into a robust enterprise today with 27 faculty, 54 graduate students and over 400 undergraduates. Dr. Monty served as Coordinator of the Life Sciences from 1973 to 1984 and oversaw the design and construction of the Walter’s Life Sciences Building on the UTK campus. In the early 1990’s, Governor Lamar Alexander (then UT President) appointed Dr. Monty to head the Governor’s School for the Sciences at UTK and to also serve as the Founder and Head of the Academy for Teachers of Science and Mathematics. Over 600 administrators and teachers completed the Teacher’s Academy during his tenure as director. Dr. Monty maintained correspondence with many of these individuals until recently, inspiring them to strive for excellence in their high school teaching. He was instrumental in creating the UT Office of Special Programs and served as the Director of the Tennessee State Science Olympiad and the Academic Decathlon. He retired from UT in 2004. Throughout his tenure at UTK, Dr. Monty was a dedicated advisor to students, teachers, and administrators and a champion for excellence in education. In 2014, he organized and established an annual Biochemistry Alumni Graduate Award recognizing a graduate student for combined excellence in both research scholarship and teaching. In his early years in Knoxville, Dr. Monty was very active in his neighborhood serving as the vice-president and president of the newly re-organized West Hills Community Association. During these years, he worked to bring city services to West Hills and helped preserve the land that later became the greenway and trail system in the West Knoxville area. More recently, he read avidly and enjoyed spending time with his many colleagues and volunteered by delivering and collecting donations for Mobile Meals. He is dearly missed by his family and friends. A memorial service for Dr. Monty will be held on Saturday, June 18 at 2:00 p.m. at the McClung Museum, 1327 Circle Park, on the University of Tennessee campus in Knoxville. In lieu of flowers or other considerations, the family suggests tax deductible contributions be made to the UT Foundation; please specify it is for the Biochemistry Alumni Graduate Assistant Endowment and send to Don Eisenberg, 137 Alumni Memorial Building, Knoxville, TN 37996-1331: (865) 974-2504, volsconnect.com/biochemgaendowment. Or donate to Mobile Meals of Knoxville: (865) 524-2786 or www.knoxseniors.org/mobile.html.